Public pressure is piling on Jordan to ease restrictions on entry of refugees where some have criticised the kingdom's stance towards Syrians many of whom have close kinship with Jordanians on the border. Amman: The Jordanian army began delivering humanitarian aid to thousands of displaced Syrians who took shelter near its border when major fighting broke out in southern Syria this month, a government spokeswoman said on Saturday. “This is in line with Jordan’s stance to help our Syrian brothers,” Jumana Ghunaimat told the state news agency. 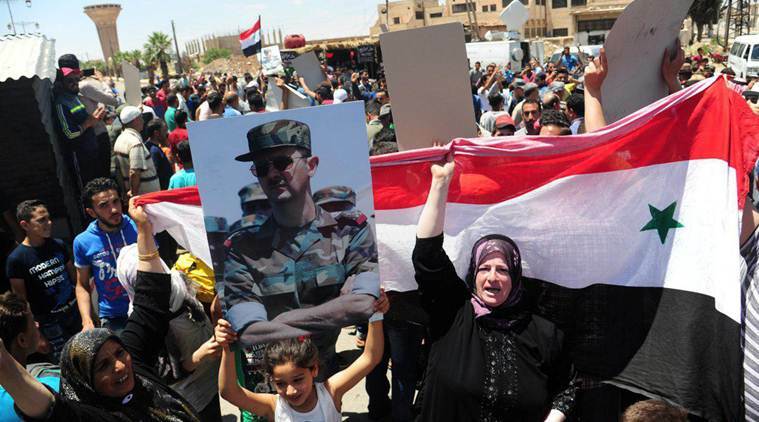 Several thousand Syrians had gathered near a closed border crossing earlier on Saturday pleading to enter Jordan, which closed its borders after the Syrian army launched a major offensive this month, uprooting tens of thousands of people. Social media footage showed large crowds of civilians, many children and women thronged facing Jordanian troops and tanks stationed along the heavily sealed border with Syria. Tens of thousands of the more than 160,000 civilians who have been displaced, according to UN figures, have given up on entering Jordan and have instead headed westwards to the Israeli border. Heavy fighting has taken place in Deraa city where rebels control its the border stretch with Jordan and several mortars have fallen in Jordanian territory but no casualties have been reported. “We are continuing to do everything to help civilians in the south on their land. We are moving in all directions to bring a halt in fighting and protect civilians,” Foreign Minister Ayman Safadi tweeted on Saturday.